The day started out sunny and frosty. I thought the thermometer on our patio read something like 14 degrees as I left the house. At one point during my travel, however, I glanced at the dashboard… the car's thermometer was reading 6 degrees (F). I'm not sure what that was about. It didn't seem that cold to me! The natural beauty (and light traffic due to the Presidents Day holiday) made for an enjoyable drive to work. Put in a nice, solid day of effort including a configuration tweak on our new MozyPro backup software — it needed to have a dedicated Temp directory set up on a drive with more free space along with a small Windows registry edit. Rovin, the helpful young man on the phone from India, had the right solution on the first try. Unseen by me during the day, clouds were thickening and by the time it was time to go home, it was lightly snowing. I took a look out the office window from which I spied the insanely beautiful snow drift sculpture not many days ago. 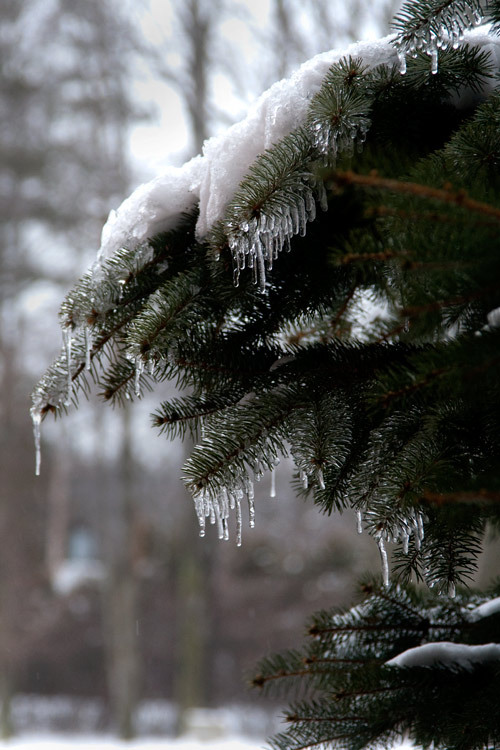 There, wet from unseen thaw above, a small forest of icicles was forming on an evergreen tree. I shot a few photos before leaving for a snowy drive home. Back to the gray grind of work and winter weather. I like the ice, showing so clearly in the picture!